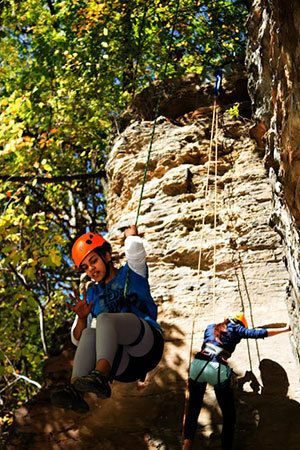 Triple C climbing at Grand Ledge, Mich.
A novel University of Notre Dame program is using rock climbing as means of connecting South Bend area young people to the outdoors while teaching them important life lessons. Founded by Victoria Lam, a Notre Dame doctoral student in biology, the program is titled “Triple C.” The “C’s” stand for camping, climbing and cameras. Lam was inspired to create the program by an organization that teaches rock climbing to youth in her native northern California. Her initiative unites graduate and undergraduate students in utilizing their skills and experience to benefit young people, with a primary goal of helping them foster an appreciation and respect for natural resources and develop a passion for the outdoors. Triple C’s activities focus on education in ecology and wilderness preservation, sports and nature photography, and participation in outdoor recreation. The program also offers an online photo journal where participants share their experiences. The inaugural six-week Triple C class consisted of 14 sixth-grade through high school students. Lam worked with Manuel Rocha, president of the Notre Dame Climbing Club, to pair participants with undergraduate mentors who trained the kids in rock climbing. Triple C collaborated with graduate students in the arts and sciences to serve as photography and ecology instructors for the kids. They learned about fitness and nutrition, kayaked, canoed, participated in a stream ecology exercise at Juday Creek and celebrated the conclusion of the program with a rock climbing trip to Grand Ledge, Mich. Triple C operates in conjunction with the Notre Dame Climbing Club, the University’s Robinson Community Learning Center and South Bend’s La Casa de Amistad. It also receives support from Notre Dame Rec Sports, Grad Life ND, Outdoor Nation and the Merrell Pack Project. The program is currently planning its second season of activities and seeking participants. More information is available at www.facebook.com/CampingClimbingCameras. Originally published by William G. Gilroy at news.nd.edu on March 07, 2014.